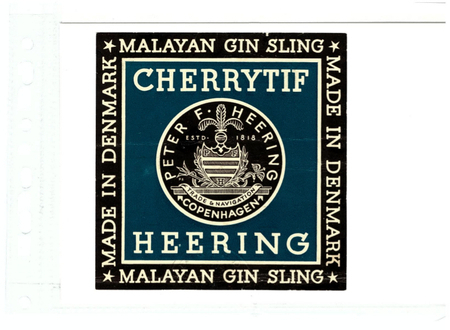 The history of Peter F Heering, the company behind Cherry Heering liqueur, dates back nearly 200 years. 1806 Peter Fredrik Suhm Heering (1792-1875) get his first job with a Pharmacist in Copenhagen and stays as an apprentice and later a clerk. During this period (1806-15) Peter Heering is given the secret recipe of a ‘Cherry Brandy’ by the wife of this employer. 1815 Peter Heering starts to work for a colonial goods trader and learns that trade. 1818 Peter F Heering is founded when, at the age of 26, Peter Heering opens his own small shop in Copenhagen trading in colonial goods. 1820-30s Cherry Heering, at the time called ‘Cherry Cordial’ quickly gains reputation. Ships captains start to include the liqueur in their cargo for trade in ports around the world where they sourced colonial goods. 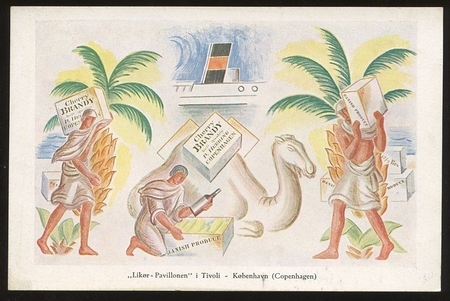 Exports take off to many countries in Europe and around the Mediterranean, Brazil, Batavia (Dutch West Indies, today Indonesia) and West Indies (Denmark had colonies in the West Indies, e.g. St Croix). 1833 To gain better control of his exports of “Cherry Cordial”, Peter Heering acquires his first ship, the schooner ‘Arnold’, named after his first son. Many more ships were to follow, but later, when the steam ships revolutionized transport at sea, Peter N. Heering, the founder’s son, decided to pull out of the shipping business in 1876 to solely focus on the liqueur business. 1836 Establishment of the first steady UK agent with 50 cases of Cherry Heering shipped to a wine merchant in London, the start of a trading relationship that was to last for more than one hundred years. 1837 Heering’s ship, the brig ‘Christian’ sails for North America, with what is believed to be the first shipment of Cherry Heering bound for the USA. 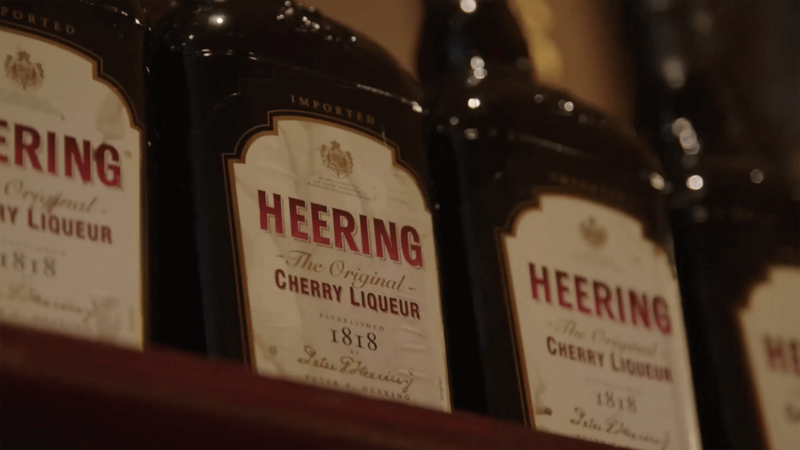 1838 Peter Heering acquires the Heering Gaard estate in the area of Christianshavn in Copenhagen to where his entire trading business is relocated, including the production of Cherry Heering. Heering’s first son, Peter N. Heering is born. 1841/43 Heering receives a letter from a Danish doctor working in and around India. 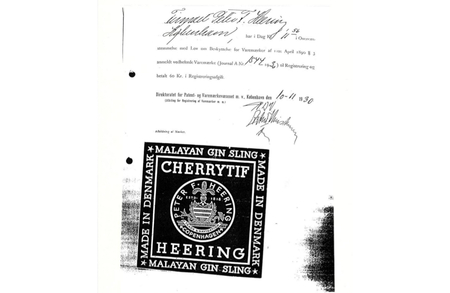 The doctor claims to have found Heering’s Cherry Cordial in Calcutta, Madras, Pondicherry, Tharangambadi (at the time a Danish colony called Tranquebar) and as far away as Rangoon. 1845/47 First report received that Cherry Heering had reach Mainland China. In 1845-47 Heering’s ship ‘Galathea’ made an expedition passage around the world. When meeting with the Governor of the southern Chinese costal port of Amoy, the captain of Galathea later reported that his Chinese hosts served “an old friend”, as he called it [Cherry Heering], as digestive after the dinner. 1868 Peter F. S. Heering is injured in an accident which he never fully recovers from and his eldest son, Peter N. Heering, aged 30 years, takes over the running of the business. 1870-73 Cherry Heering is delivered on numerous occasions to the English Royal Yacht ‘Victoria and Albert’ while anchored in Copenhagen. These deliveries were quickly followed by many orders from the aristocracy and other prominent people in the United Kingdom and in Europe. 1875 Peter F. S. Heering passes away aged 83. 1876 Heering becomes purveyor to the Royal Danish Court. 1878 Heering becomes a supplier to the Imperial Russian Court and to H.R.H. the Prince of Wales. 1881 The year the oldest bottle of Cherry Heering that is known to have survived to this day was produced. 1900 Cherry Heering signed for import by Suntory of Japan as their first import brand. The Heering trademark is registered in Japan. Shenely Importing Co. is awarded the importation rights to the USA. Brothers Harald and Willam Heering take over the responsibility for the business. Also, Around the 1900s, the product starts to be called ‘Cherry Brandy’ instead of ‘Cherry Cordial’. 1911 Heering began exports of a ‘Cherry Whisky’, sold under the Heering brand name. 1914-18 Exports are made impossible by the First World War. The company survives by focusing on the domestic Danish market. 1915 At the Raffles Hotel in Singapore, the legendary bartender Mr Ngiam Tong Boon is credited with concocting what we know today as the Singapore Sling cocktail. He is believed to have used Cherry Heering as one of the drinks key ingredients. 1921 Curaçao Heering, a completely new product is introduced to the market. Other new products followed soon after, including Liqueur Palmet, Cacao Heering, and Komma. 1922 This classic cocktail Blood & Sand, in which Cherry Heering is a key ingredient, is created and named after the 1922 film starring Rudolf Valentino as a bullfighter. 1930’s The production method is modernized, less manual work, new modern machines to take care of processing of the cherries. 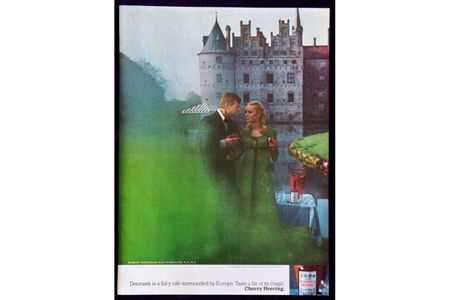 1946 The production of Cherry Heering is moved from of the Heering Gaard estate in Copenhagen to a new plant near the cherry orchards of Dalby. 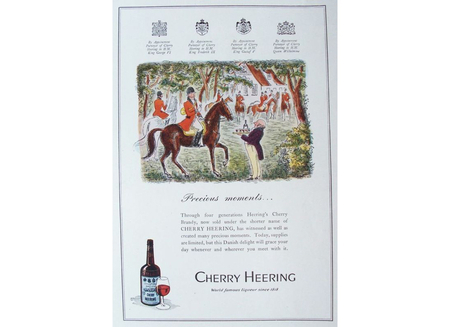 1950-60s Cherry Heering is sold in some 144 markets, selling some 350,000 9-litre cases per year. It is the second best-selling liqueur in the USA after Benedictine D.O.M. 1957-77 The Heering Shipping Line is restarted and new ships ordered for a merchant fleet. 1961 Heering acquires a 25-year license to produce and export Kahluá outside Mexico and the USA. 1963 Prince Charles, then aged 14, is caught by an English reporter buying a glass of Cherry Heering at a hotel near Grodonstroun in Scotland. It was a scandal, and following the incident, the legal age to buy alcohol in Scotland was set to 18 years. 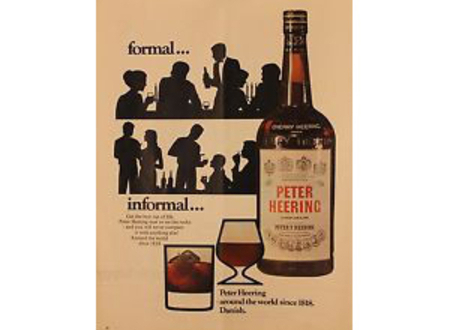 1970 The name Cherry Heering was changed in the corporate communication to “Peter Heering”, in an effort to avoid association with cherry pickled herring. 1973 The reestablishment of the Heering Shipping Line proved to be a fatal mistake when the oil crisis hit in 1973, proving a financial disaster for the Heering family. 1974 Christianshavner Aquavit is introduced to the market. 1975 Most of the administration of the business moves is relocated from The Heering Gard estate to the production facility in Dalby. 1977 Privatbanken, a Danish Bank, took over The Heering Gaard estate. 1990 Peter F Heering Company was acquired by Danisco A/S of Denmark and was merged with their subsidiary De Danske Spritfabrikker (later named Danish Distillers). The new owners instigate a major re-branding including the introduction of a new square bottle. 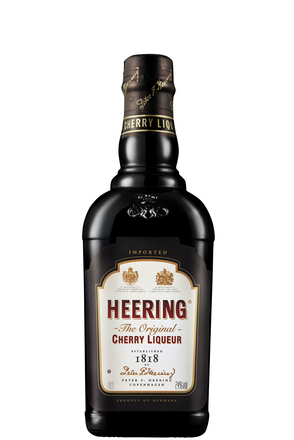 The product name is also changed from Peter Heering back to Heering Cherry Liqueur, affectionately known as Cherry Heering. 1999 De Danske Spritfabrikker, including Heering, was acquired by V&S Group. 2006 The Heering brand was acquired by the Tilander family. 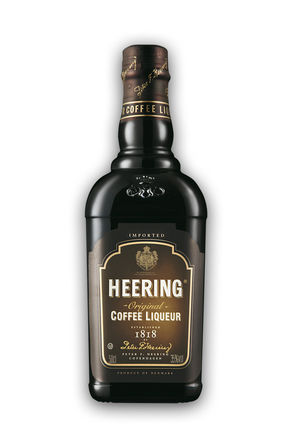 2008 Coffee Heering was reintroduced to the market. 2009 The Copenhagen, the official cocktail of the city of Copenhagen, was created (of which Cherry Heering is a key ingredient). 2013 The Peter F. Heering Sling Awards were established.